The University of Southampton has completed the acquisition of the Broadlands Archives - one of the most significant manuscript collections in the UK. The Archives were secured thanks to a major fundraising campaign mounted by the University launched in November 2009. The campaign attracted a significant award of nearly £2m from the National Heritage Memorial Fund (NHMF) with major support from a number of benefactors and the generosity of members of the public. To complete the acquisition, the government has announced the allocation to the University of the papers of Earl and Countess Mountbatten of Burma, which were accepted for the nation in lieu of inheritance tax. On Monday, 30 January, the University of Southampton opens an exhibition entitled ‘Everybody is in admiration of it: Broadlands, a country house in Hampshire’, which focuses on the day-to-day life of the great house. The exhibition, in the Special Collections Gallery of the University’s Hartley Library, will feature vignettes of daily life drawn from family correspondence and the records of domestic service, horticulture and farming, along with engravings and other illustrations of Broadlands taken from the Archives. 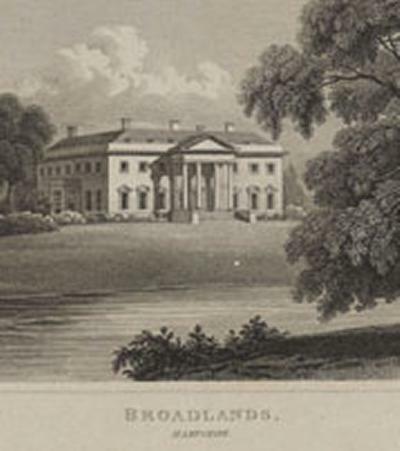 With documents dating from the 16th century to the present, the Broadlands Archives shed unique light on historic events surrounding the estate, its many distinguished inhabitants, and its relationships with the local community. Comprising more than 4,500 boxes of documents and other materials, the Broadlands Archives includes correspondence of the Victorian Foreign Secretary and Prime Minister Lord Palmerston. The Archives feature approximately 250,000 papers and 50,000 photographs of Earl Mountbatten of Burma, the last viceroy of India, and effectively serve as the foundation archive for the modern states of India and Pakistan. Among the documents is a handwritten note passed by Mahatma Gandhi to Lord Mountbatten, at a crucial meeting in June 1947. Gandhi had taken a vow of silence and by this means did not comment on the decision to divide the subcontinent that was about to be announced. The collection also includes the diaries of the 19th-century social reformer and philanthropist, the 7th Earl of Shaftesbury, and material for the Temple and Ashley estates in Hampshire. The Broadlands Archives have been on loan to the Hartley Library since 1989. Stored in purpose-built facilities, the collection is publicly available and has been used by researchers from around the world. The exhibition, ‘Everybody is in admiration of it’ - Broadlands a country house in Hampshire, runs from Monday, 30 January to Friday, 30 March in the Special Collections Gallery, Level 4, Hartley Library, University of Southampton Highfield Campus. The exhibition is open from 10.00am to 4.00pm, Monday to Friday (excluding bank holidays). Admission is free. Visitors may be asked for proof of identity by reception staff.